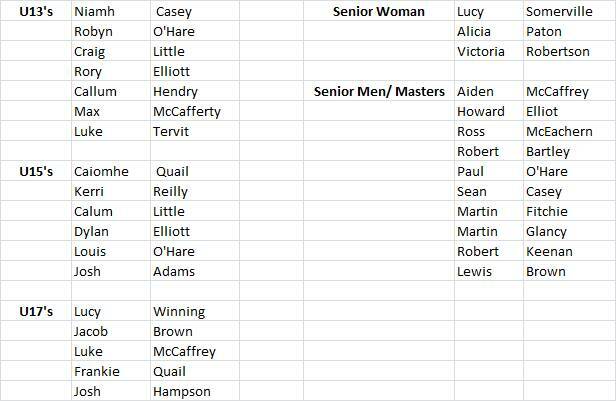 Last weekend the Clubs Seniors kicked off the Winter Season with a number of great performances at the George Cummings RR’s, this Sunday – 15th October – they will be joined by a number of the Clubs Junior Middle Distance Athletes to take part in this years West District XC Relay Championships at Hamilton Race Course. The timetable of events for the day can be found here. The Club will be taking a mini bus through and will be leaving Broadwood Stadium at 09.30 and will be leaving Hamilton Race Course after the last Club Athlete has ran. Those making their own way there, can you please let Stephen know please make sure you are at the Club Tent at least 1 hour before your event. Saturday 21st October – LAAA Road Running Relays – Drumpellier Park – U11’s to Masters – closing date 16th October. Saturday 28th October – National XC Relays – Cumbernauld Park – U13’s to Masters – closing date 13th October. Sunday 4th November – Lasswade XC – Goerbridge – U11’s to Masters – entries on the day.